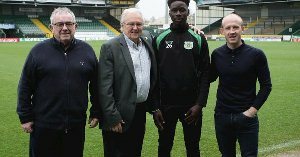 Promising left back Daniel Ojo, 17, has been rewarded with a new deal by EFL League Two club Yeovil Town. Yeovil Town have reported on their official website that Ojo has signed his first professional contract which will keep him at the Glovers until at least June 30, 2021. The highly-rated defender made his first team debut against West Ham U21s in an EFL Trophy clash a month ago, and featured in behind closed doors friendlies against Bristol City and Aston Villa. Speaking on the new deal, Ojo said : ''It's an honour for me to sign a professional contract and I'm grateful for the opportunity to continue improving. Daniel Ojo, who is eligible to represent the national teams of Nigeria and Italy, joined Yeovil Town from Charlton Athletic in the summer of 2017.